Transistor T2 with surrounding components is a simple collpits crystal oscillator. The oscillating frequency mainly depends on the value of the crystal X1, but can be varied some kHz by tuning C3. The oscillator signal is transfered to T3, which has to be a transistor which can handle some more power. I used a 2N3866, but you may use almost any power transistor you like. L1 and C7 block RF feedback to your DC, just pick a big inductor for this application. I used a 15mH inductor, simply because I found it in my junkbox. The OXO transmitter has a simple keying circuit which powers the amplifier (T3) on and off, so the oscillator runs continiously. Since my fox is in a plastic box, you can still hear the oscillator with your receiver, so I decided to key the oscillator aswell. The result is that the power of the whole transmitter is keyed now, using T1/R1/C1/C2. The advantage is that almost no power is consumed when not keying the transmitter, which saves your battery. With key-down the transmitter will put a whole spectrum of frequencies in the air. If you have a oscilloscope, just look at the signal at the collector of T3: this is definitely not a clean sinus wave! So I added a PI-filter (L2/C10/C11) to shape the signal. The output power will be about 500 mW. You may create a PCB layout for this, but I decided to build it “high-wire”. Take some unetched PCB board, and start with a component that has to be connected to ground. From that point solder the rest of the components. It is a simple and fast way of building prototype RF circuits. You probably have to create L2 yourself. I’m still not really good in creating coils, but for this one don’t use those inductors you can buy in the local electronics shop that are shaped like a resistor! It fully saturizes, no signal will get through. T3 and R6 will get warm, so put a cooling star on T3 and use a resistor for 6 which is capable to handle more power. 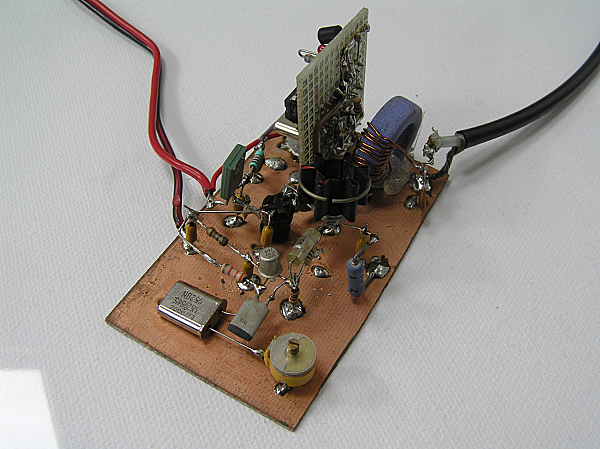 This is just the transmitter, you will probably also need a CW keyer. I built a simple one using a PIC processor, which can be found here. In most countries you have to be a licensed radio amateur to build and/or use this transmitter. Excellent work . 73 de vu3inj, indrajit from India. Hope to copy this fox and catch it.